Coin operated poker machines appeared towards the end of the 1800s and soon after, in San Francisco during the Gold Rush, a mechanic from Bavaria named Charles Fey invented the first official ‘slot machine’. 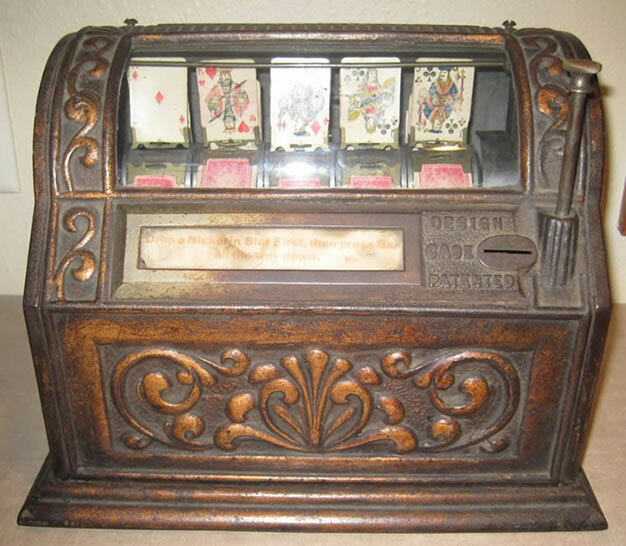 A precursor to the modern slot machine was The Card Machine, developed by Sittman and Pitt in 1891. It contained five drums holding a total of 50 card faces and was based on the card game poker. Players would insert a nickel and pull a lever which would spin the drums. There was no mechanical payout mechanism so prizes depended on the local establishment. A winning hand such as a pair of Kings might get a free beer, while a big win like a royal flush would get the player a cigar or highball. To make the odds better for the house, two cards were typically removed from the deck (hence only 50 card faces): the ten of spades and the jack of hearts. This doubled the odds against spinning a royal flush. The drums could also be rearranged to further reduce a player’s chance of winning. A mechanical payout for this kind of machine was very difficult because of all the permutations of results. The first machine to have a mechanical payout would have to have fewer spinning drums. We’ve been scouring the internet for instructions on how to build one of these Card Machines as it seems like it would be a fun thing to have around the house for your next party! So far all we’ve really discovered are the online slots. A list of these, including free penny slots (not currently available) that are perfect for beginners can be found at Slots Online. San Francisco in the late 1800s was a wild gold rush town with saloons, bordellos, cigar shops, honky tonks, and of course, gambling. Gambling machines such as Sittman and Pitt’s Card Machine were doing very well. At that time, a Bavarian mechanic by the name of Charles Fey could see the potential of gambling machines and, in the basement of his Berkeley apartment building, started to create his own machines, starting with The Horseshoe and then the 4-11-44. This latter machine was quite successful. 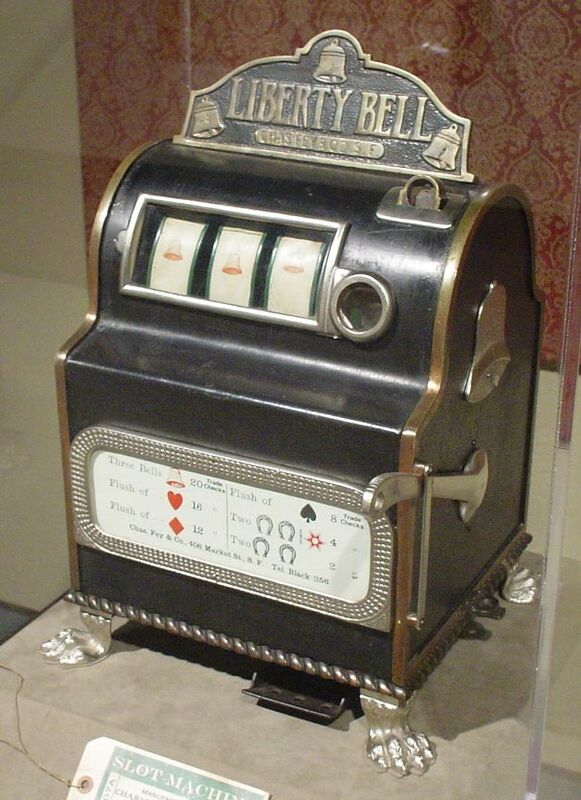 Then, in 1898 Fey built a machine called the Card Bell that would forever change the face of slot machines. 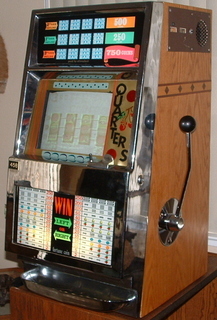 This machine had a three-reel, staggered stop, with an automatic payout design; a design that dominated the slot industry until the age of electronics and is still used in some places even now. As a result, Charles Fey is universally regarded as the inventor of the slot machine. The Card Bell had playing card symbols on its three reels at first, but a year later Fey changed the symbols to include stars and bells and renamed the machine the Liberty Bell. Three bells in a row produced the biggest payoff, ten nickels (50¢). The machine was a huge success. Many other variations of the Liberty Bell followed. It’s interesting to note that some gave out winnings in the form of fruit-flavoured chewing gums. Pictures of the flavours were used as symbols on the three reels instead of Fey’s stars and bells. Today’s slot machines often feature the popular cherry and melon symbols derived from those early machines. The BAR symbol now common in slot machines was originally derived from an early logo of the Bell-Fruit Gum Company. Because of the fruit symbols, slot machines in UK today are often referred to as ‘fruit machines’. In Canada and America they are mostly just called ‘slots’, in Scotland ‘puggy’ and in Australia ‘poker machine’ or ‘pokies’. One of the older slang terms for slot machines is ‘One Armed Bandit’. Before electromagnetic machines (and buttons) the reels were spun by pulling a lever, or arm, located at the side of the machine. And of course, these machines ‘robbed’ many an unlucky player of their coins. Many modern machines still have the ‘legacy’ lever at the side, as well as buttons. The first fully electromechanical slot machine wasn’t invented until 1963. Developed by Bally, it was called Money Honey, and had a bottomless hopper and automatic payout of up to 500 coins without the help of an attendant. The first true video slot machine was developed in 1976 by Walt Fraley who called it the Fortune Coin. This slot machine used a modified 19″ Sony Trinitron color receiver for the display and logic boards for all slot machine functions. The prototype was mounted in a full size show-ready slot machine cabinet. The first production units went on trial in Las Vegas. After that it was just a matter of time when technology also allowed the linking of multiple slot machines in multiple sites. The first progressive slot machine, called Megabucks, were invented in 1986 by the slot manufacturing company IGT. Today, a person can insert cash, or in Ticket-In, Ticket-Out machines, a paper ticket with a barcode, into a designated slot on the machine. The machine is then activated by means of a lever or button, or on newer machines, by pressing a touchscreen on its face. The game itself may or may not involve skill on the player’s part — or it may create the illusion of involving skill while only being a game of chance. There are some secrets, however, to winning at slots. See our article All you need to know about playing the slots. The advent of the internet in the 1990s coupled with faster and more powerful computers brought about the world of online slots. Today, online casinos reach a worldwide population of gamers bringing the fun of slot machines into anyone’s home. Modern digital slot machine design and game play is limited only by the imagination of the developers. Software providers are constantly pushing the boundaries in their quest for the most exciting, fun and original slot machines. 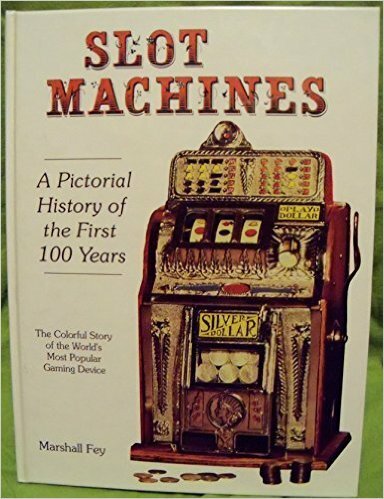 The book Slot Machines: A pictorial history of the first 100 years of the world’s most popular coin-operated gaming device, was produced by Charles Fey’s grandson Marshall Fey in 1989. Click here or on image to purchase from Amazon.